As Brad Plumer reported earlier, another oil rig exploded off the coast of Louisiana today, forcing workers to jump into the water while the rig was on fire. The Coast Guard says it has rescued all 13 workers and, so far, it looks like we're not in for a repeat of the Deepwater Horizon disaster, according to New Orleans Times-Picayune. This rig, which is owned by Mariner Energy, was in much shallower waters--340 feet deep rather than a mile. And while the well was producing oil, Mariner officials say that workers shut down the operation before evacuating. 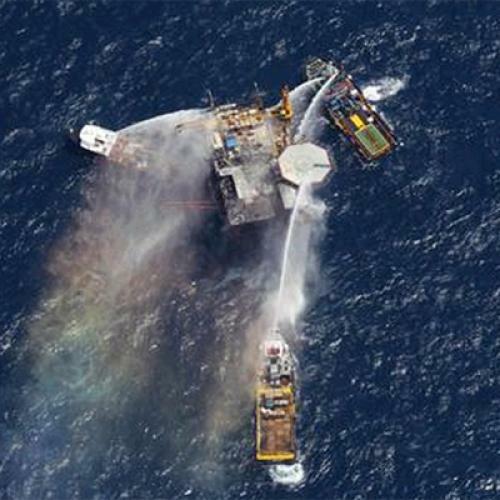 The officials also said they observed no leaking oil during a flyover, conducted while the rig was still burning. ...oil and gas industry insiders, who have fought for months to get the moratorium lifted, are concerned that the accident will be perceived as something that a moratorium would prevent. "It's certainly disheartening, and it is going to be yet another challenge for the industry," said Chris John, president of the Louisiana Mid-Continent Oil & Gas Association. "We were making some progress on the moratorium. This certainly will complicate matters." Yes it will. And I can't say it upsets me. While this incident may not strengthen the case for the existing moratorium, it should certainly remind people that there are hazards inherent in offshore oil operations--and that we should be working harder to reduce our reliance on fossil fuels. Update: Coast Guard officials are now saying they did not see an oil slick on the water, following reports suggesting they had.